DUPLI-COLOR 2K Garage Floor Paint is a seal coat for protection and decoration of concrete floor surfaces exposed to moderate, medium heavy mechanical and chemical wear, e.g. garages, laboratories, warehouses, production facilities. 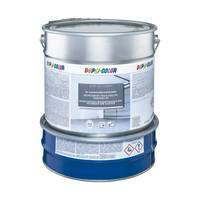 Protection of wall surfaces that are exposed to moisture, chemicals and stronger chemical loads. It can be used for protection and decoration of walls and floors covered with ceramic tiles.